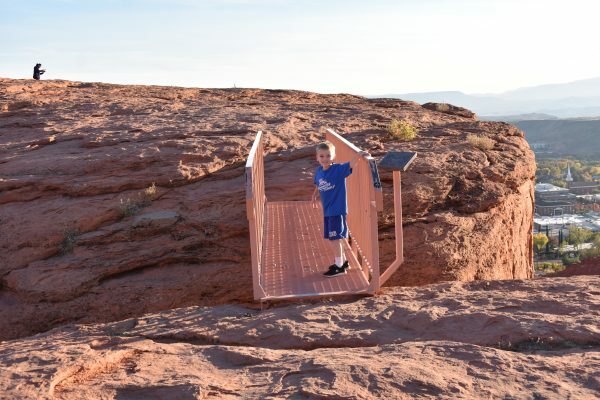 The most unique park we’ve ever been to is Pioneer Park in St. George. There is no playground equipment, no grass, and no water or beach. Still, there is a ton of fun and exploring to be done at Pioneer Park. 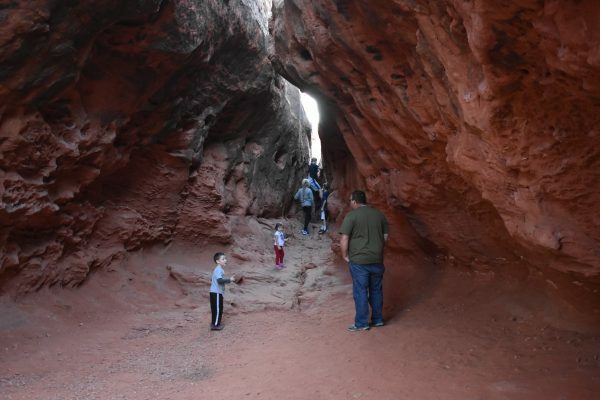 This park allows you to get up close with St. George’s red rock sandstone. There are places to hike and explore, climb, crawl, and conquer. 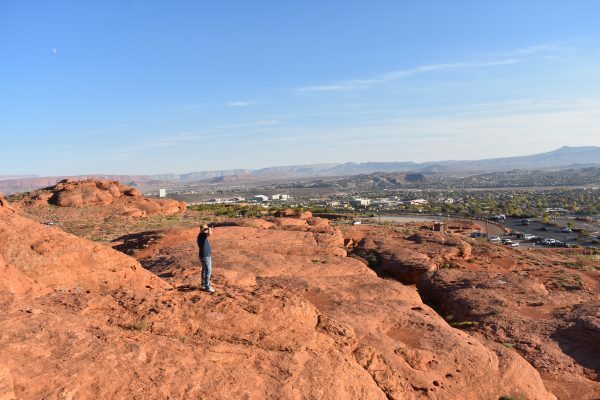 Best of all, Pioneer Park offers amazing views of St. George. There are two parking lots, an upper and a lower at the park. There is also a lot of open space in between. 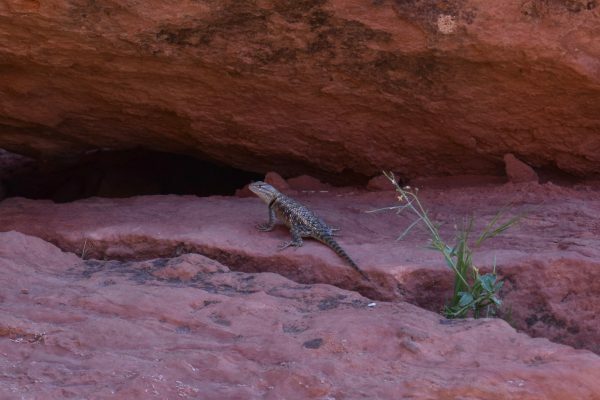 Rabbits, deer, ground squirrels, and lizards can be found among the trails. There are also a few hidden gems that you’re going to have to explore to find. 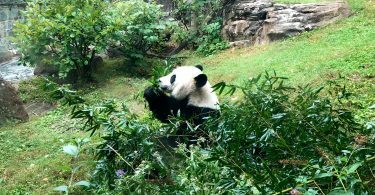 Use our map at the bottom to help you locate all these fun spots. We saw lots of lizards at Pioneer Park. We were hoping for a desert tortoise, but no luck. 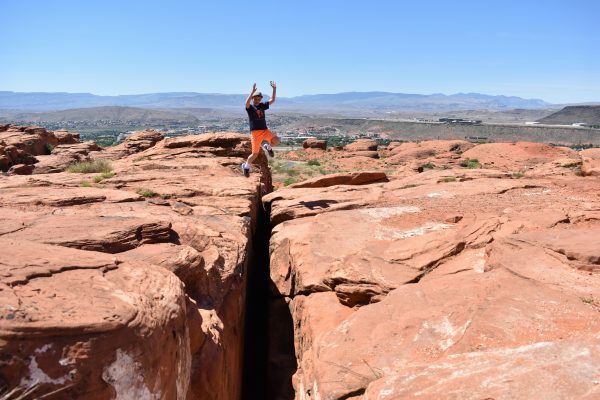 One of the most interesting features of Pioneer Park is the Crack. 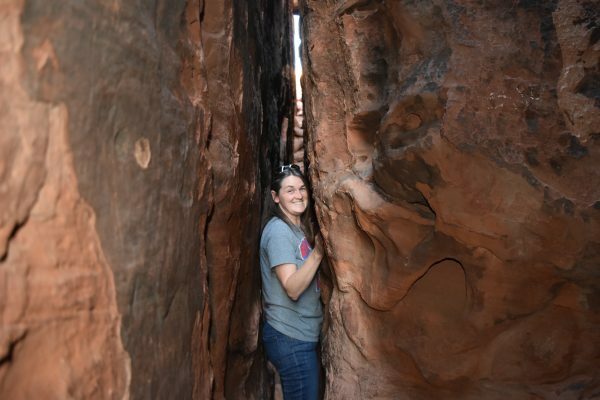 The Crack is an extremely narrow split in the rock that runs for about 40 yards. It is so narrow that our Dad, who isn’t TOO hefty as you can see in the pictures, couldn’t squeeze his ribcage through. 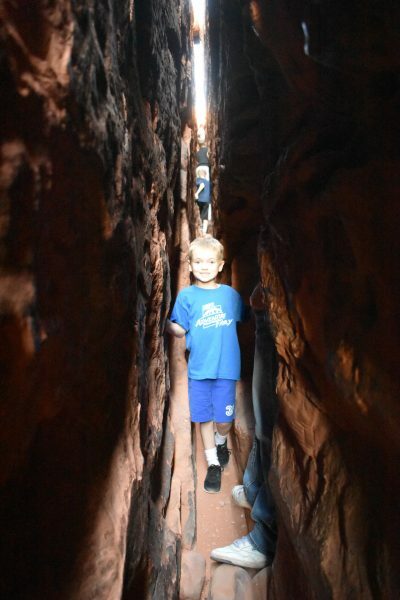 Mom made it through, though the claustrophobia was setting in, and the boys didn’t have much trouble at all. The Crack is not very wide. Once you find the crack, start at the bottom as the narrowest pinch is near the start. Then work your way up. You won’t have to turn around if you can get through that first tight spot. 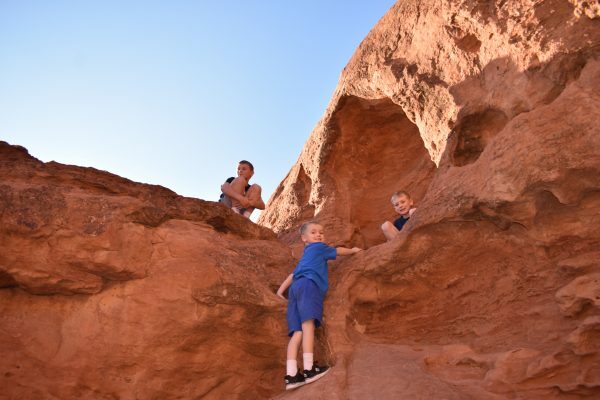 Our boys like to go up and down if no one else is squeezing through, but most people climb up and then hike back down across the slick rock. 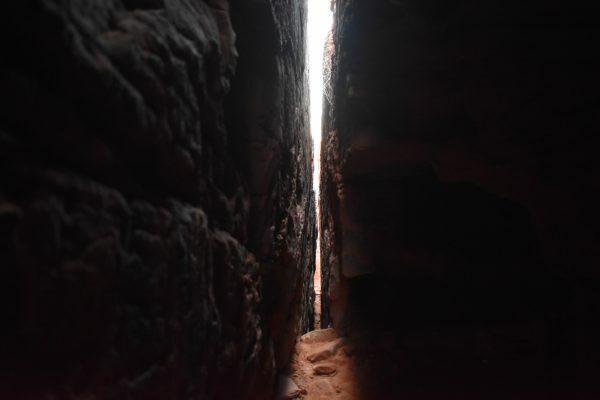 It is narrow. Most of the time you are turned sideways walking through unless you are six like this kiddo. There is one wide open area half way up the crack to explore. 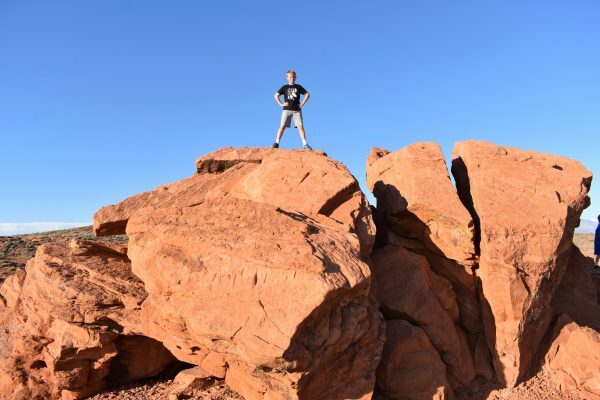 Once you reach the top of “The Crack” there are great views of St. George. 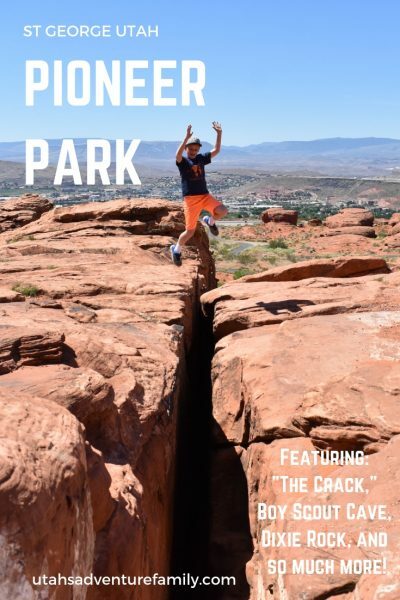 The Crack is found toward the back of Pioneer Park. If you drive the road, there is a small dirt parking area right by the entrance to The Crack that is separate from the paved parking lot. We parked in the parking lot, and headed back toward the road. 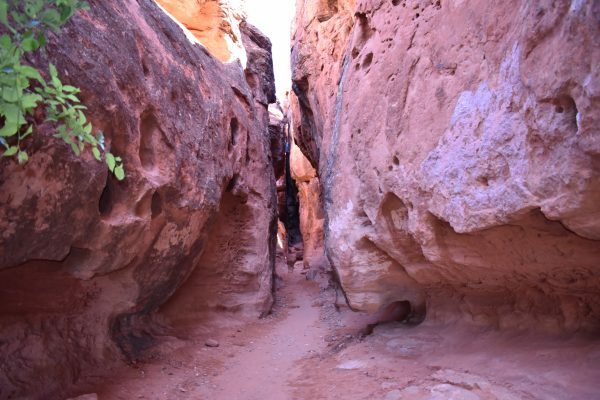 The Crack also has a lot of green trees at the entrance, which is odd for the red rock, so it is easy to see. This is the entrance to The Crack. The next thing to see is the skyline overlooking the St. George Temple. 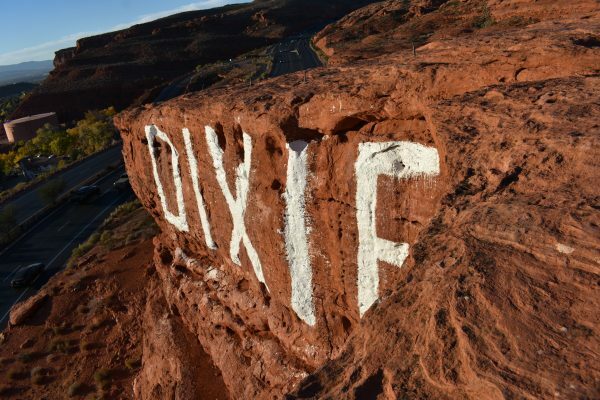 There is a handy metal bridge to cross, and you come out right above the white paint that says Dixie. 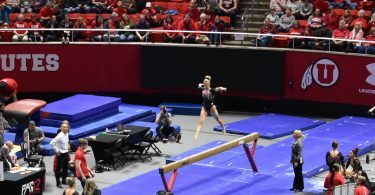 It’s tough to get a good look at Dixie because of the ledge. We dubbed this area the Overlook because it allows you to see all of the town sprawled at the base of the cliff. This is a great places for pictures. 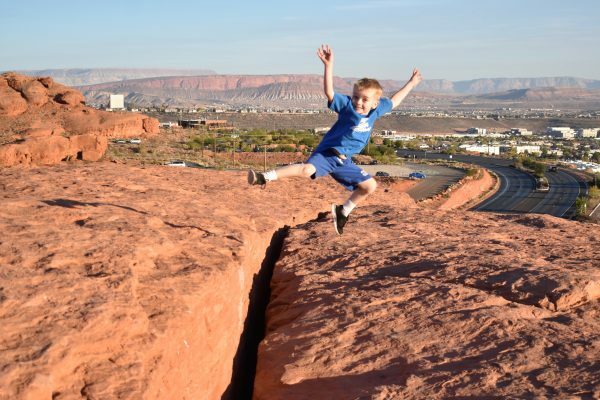 Just don’t let little ones wander too close to the edge unsupervised as that could lead to a nasty fall. Look for this bridge, which leads to the Overlook. The views from the Overlook are amazing. We had such a fun time at Pioneer Park. 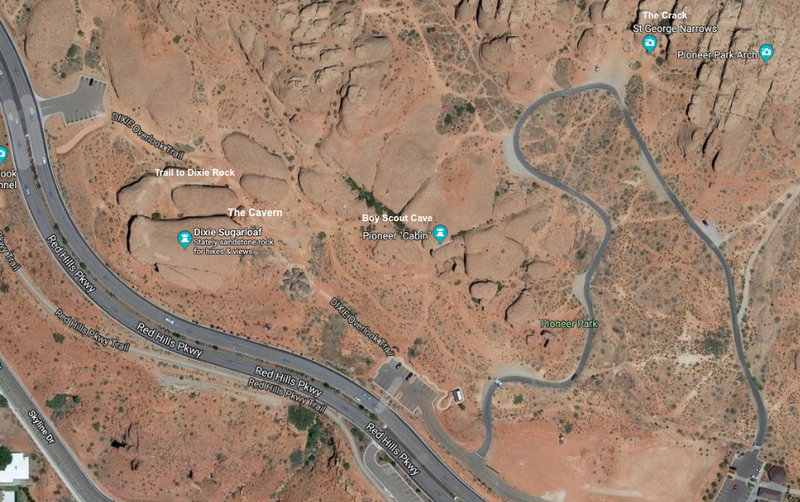 If you drive past the Dixie on the rock and then park in the parking lot, you will be next to the bridge to climb up to the Overlook and Dixie Rock. Near the Overlook is another area we called the Cavern. It isn’t a completely closed cave, but rather a large wide room that narrows to just a ribbon of sky above. Our boys loved the acoustics of this “room” and kept shouting to hear their own echo. You can scale out the top of the Cavern toward the Overlook without too much trouble if you’re much of a climber. This large Cavern was near the other parking area. This large Cavern was a blast to explore. Even Dad could climb out the far side of the Cavern. It is also worth walking over to a small man-made shelter built into the rock. 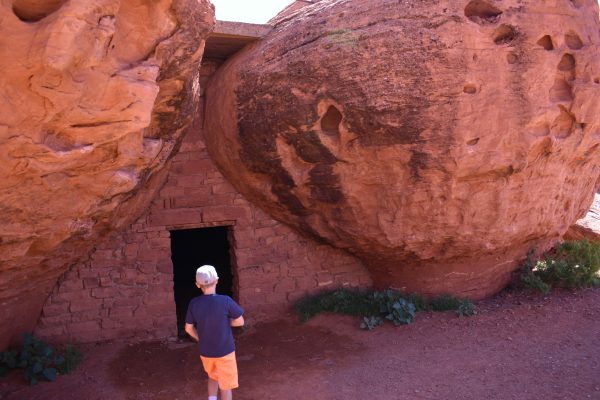 Locals call this area the Boy Scout Cave, because it has been used as a campsite for generations. It is an old pioneer structure that is quite cool inside even on the hottest day. As with all of the features of this park, you’ll have to explore around a bit to find it. 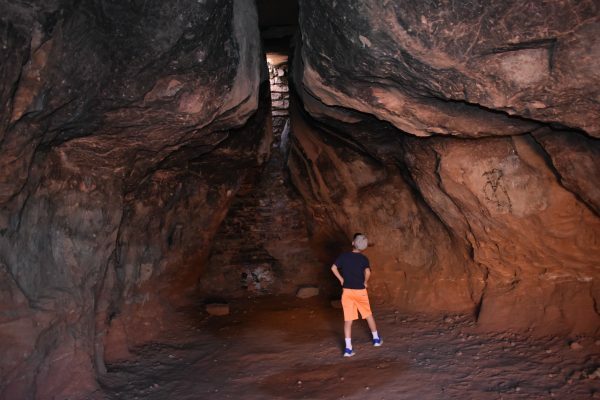 This is Boy Scout Cave hidden in the rocks. It’s interesting to see the chimney and to imagine sleeping in the cave. Make sure to visit the Arch as well. 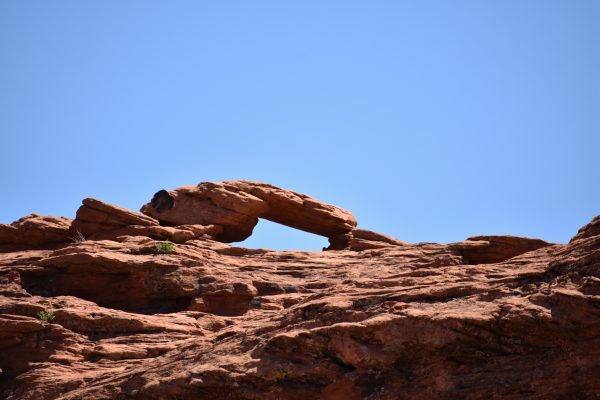 This is a nice red rock arch that you can climb on and photograph. It can easily be skylined, and it isn’t so big that it is dangerous for the kids. The Arch is near the Crack. 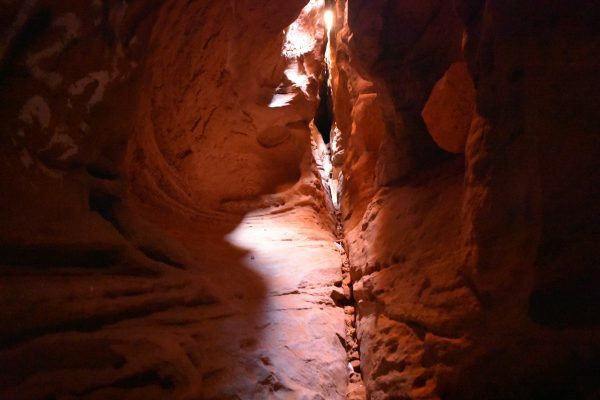 As with all your adventures in sandstone country, don’t scratch or mark the rock in any way. This is not only poor manners, it is illegal. This arch is visible from most of the park. Just explore! This was our favorite part of Pioneer Park. 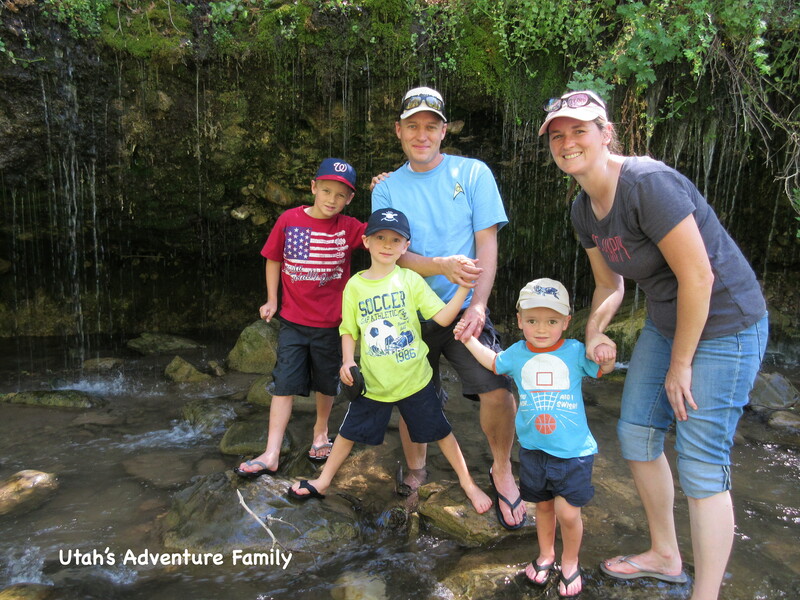 We loved wandering around, climbing on rocks, and finding lizards. Our boys had a great time being able to run around and see what was around the next corner. 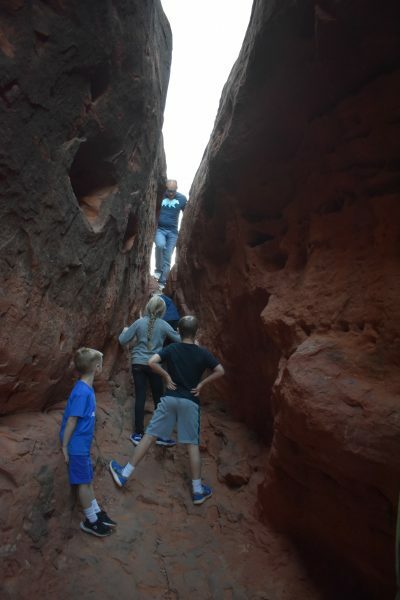 There are drop-offs and steep cliffs, so make sure to explore as a family so that everyone is safe. 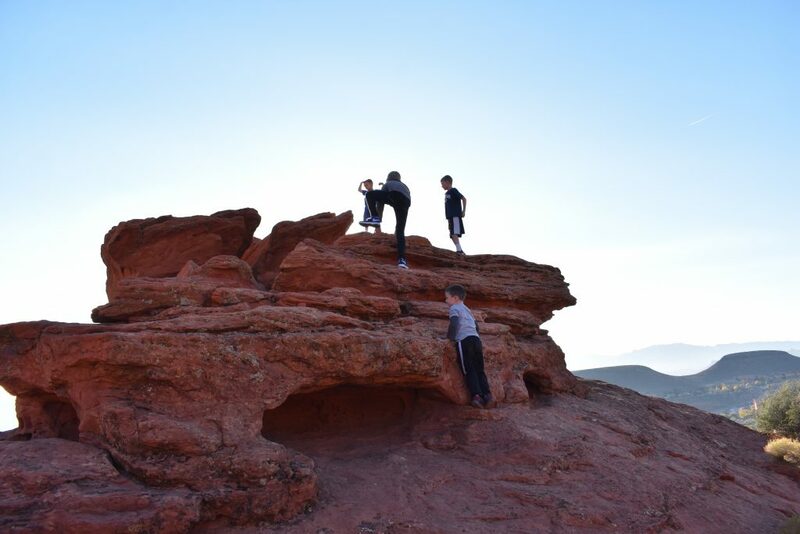 These kids would have climbed all day if we’d let them. 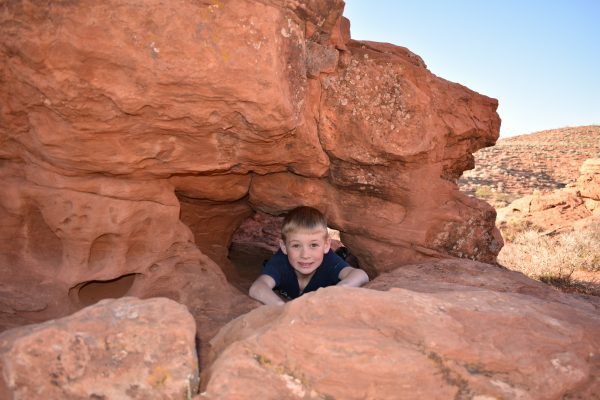 There are lots of fun little arches and holes for kids to climb in. Pioneer Park has so much to do. Lots and lots of climbing! Water: Even in the winter, after all the exploring you do, you’ll want water. Make sure to have water with you. There are bathrooms at Pioneer Park. Leave No Trace. There is a pavilion for picnics, but make sure to clean up all trash. Respect the wilderness here and don’t carve on the rocks. Stay together: This park is quite large and you could easily lose someone. There are also some dangerous edges that could lead to a fall. We told our boys they had to be able to see us, and we explored this park together. Wear good shoes. 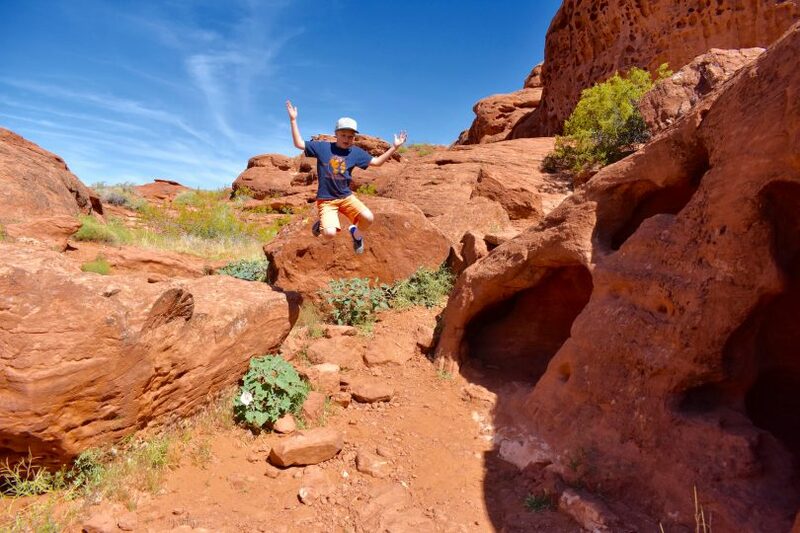 You do not want to be wearing flip-flops when you explore Pioneer Park. There is a lot of walking and climbing.